In 2007 I had the opportunity to sail across the Atlantic with the Swan 65 s/y Blue Magic. Sailing across the Atlantic had always been a dream for me, but a dream that could not be realized, I thought. For me, the Gulf of Finland had been the great sea. I was told by a friend that s/y Blue Magic searched crew for an Atlantic crossing. It was not difficult to decide whether I should participate because It would be a once in your lifetime event. There was nothing wrong with the boat, it was a Swan 65 which once had sailed around the World in Expo98. Then Folke West was the skipper and the boat’s name according to the sponsor: Fazer Blue Magic. 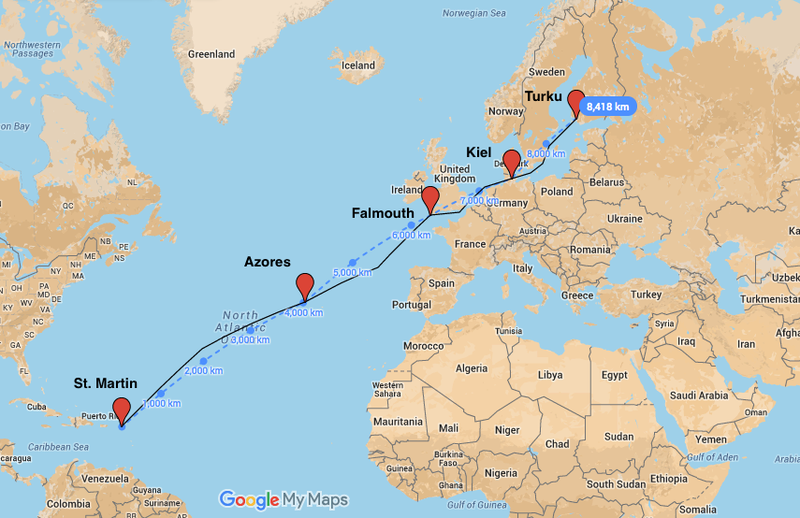 The plan was to start in early May from St. Martin in the Caribbean and sail via the Azores to England. From England, we would continue through the Kiel Canal to Turku, where we calculated to land on June 10th. The trip would take about five weeks. The day I was standing on the pier in the Caribbean and looked across the Atlantic Ocean seemed unreal. I could’t imagine how the following weeks would be. After the departure, May 6th, it would take over two weeks (2000 nautical miles) before we on the boat could see land again. The next stop would be Horta, Azores in the middle of the Atlantic Ocean. Prior to the departure, we went through the safety rules on board. The main thing was that everyone would be wearing safety harnesses attached to the boat during darkness and bad weather. It took about two days to get used to the guard rhythms on board. We had a guard system with two guard tours (four people in a guard). Daytime the was guard was six hours and nighttime the guard was four hours. For me, the system was suitable and I got enough sleep. Daily life on board was in itself an experience. To constantly live on the leaning plane of motion did small everyday tasks difficult. Even going to the toilet or washing your teeth were big projects. When you moved around inside the boat you felt like a monkey swinging with your arm muscles ahead. We had bath day about once a week if the weather allowed us to take a dip in the sea. It felt quite strange to swim when you knew that you had 6 km water underneath. During the crossing, we didn’t see many other boats, but we weren’t completely alone on the sea. We had daily visits from whales, dolphins and flying fish. Someone yelled “Dolphins!”, and the whole crew was on deck to see the nice dolphin show. It is said that an Atlantic Crossing can not succeed without problems. For our part, the problems in the end was quite a few, but there were nothing we could not handle. The first thing that happened was that the autopilot stopped working. It did not cause major problems because we had enough crew to have someone constantly at the helm. For a single sailor the problem could have been crunching. The most frightening thing that happened during our crossing was that we collided with a wreck in the middle of the Atlantic. As helmsman you easily only stare at the compass when you steer, because it is only water around on all sides. The wreckage was floating upside down so that only the bow appeared above the surface. Fortunately the wreck hit us in the side, so it caused only a few scratches. This event probably got the entire crew to be more awake at the helm and it was clear that you had to keep your sight well ahead now and then. We also had a fire under the engine, the forestay profile was twisted, the anchor gear got a short circuit and spat out 80 meters anchor chain in the ocean hanging from the bow, the hydraulic system stopped working and the plotter compass displayed the wrong direction. We learned to live with the problems, but every time something happened we wondered what would happen next. I will never forget the day when we accidentally ate shredded meat that actually was animal food. So it can go when shop in a Portuguese shop at Azores and don’t know the language. A flying fish that landed on deck. Skipper checking the damage after the collision with the wreck. The crew looking at a dolphin show. It was really nice to take a brake at Horta, Azores. We landed there May 19th and stayed there for few days. It was great to have steady land under your feet again, but the first steps was a little bit wobbly. At Horta we visited several times Peter’s Cafe, which is a famous place were Atlantic sailors meet. We also drove around and looked at a few tourist attractions, like the crater at the highest point and the volcano cape Vulcão dos Capelinhos. The first night at Peter’s Café. The piers at the marina. The pier at the marina. The day, May 31th, when we saw the English coastline felt nice. We had passed across the Atlantic without any major problems. Once we took ashore it was time for party and celebration. Work continued nonetheless immediately the next day. We had to get the boat ready in sailing condition for the journey home to Finland. There was also a crew change. Of the original crew, who had started from the Caribbean, it was only me and the skipper who sailed all the way home. The next stage would bring us across the North Sea to the Kiel Canal. Then it was just a sail across the Baltic Sea. Everything felt so safe when you constantly had land in sight. The distances at sea had completely different meanings for me now. When I saw the first glimpse of the Finnish archipelago, I could not help but stare at the rocks and enjoy the land scent that came towards us. I have not previously thought that land smells so much! We took ashore of the Aura River in Turku, June 10th, exactly five weeks after the departure from St. Martin. It felt good to finally come home after many weeks at sea, but it was also a bit sad to get rid of what had been a weekday and routine for several weeks. The cause of the fire under the engine. English coast in the horizon. The repair of the forestay. You can notice the tide, as the surface has dropped. Blue Magic next to a liitle bigger boat, Braveheart. My favorite place, the helm. Sailing in the North Sea. The first lock int the Kiel Canal early in the morning. Here they played Finland ‘s national anthem when we drove past. The Öland Bridge at Swedish coast. The Finnish archipelago in sight! The Aura River in Turku. After returning home, it was a bit difficult to adapt to everyday life and daily rhythm on land. For weeks I had been sleeping and waking up irregularly. Lots of people have asked me if I would like to sail across the Atlantic again. My answer is: Of course! In the beginning, I experienced the trip as a “once in your lifetime” event, but now I see it more as a beginning of something bigger. Life is full of opportunities and challenges, but it is difficult to know which to choose.